CLEVELAND, OH--(Marketwired - March 24, 2016) - Barrette Outdoor Living has enhanced their current fleet of vehicles with updated graphics that highlight and promote the company's Boerboel® Gate Solution products. Four of the trucks are outfitted with the new graphic designs. The trucks are part of an existing fleet of Barrette Outdoor Living vehicles, currently based out of Barrette's Brooksville, FL location. The trucks deliver fence and railing products, along with Boerboel gate hardware products, to hundreds of locations across the country, with heavy concentration on retail outlets and distributors located in the eastern and southern parts of the United States. "As Barrette Outdoor Living has grown over the last several years, adding new brands and new product lines, our main focus has always been to provide superior service to new and existing customers. 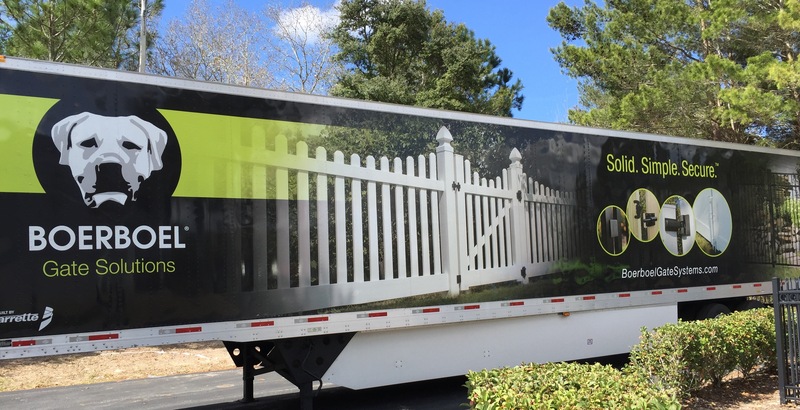 Whether it's our retail partners or our loyal distributors, our fleet of trucks allow us to bring product quicker and more efficiently to the end-user, our customers," said Barrette Outdoor Living President Jean desAutels. "We're excited to now promote our growing gate product line to our customer base," added desAutels. Updated trucks now display images featuring Boerboel® Gate Solutions products -- a variety of latches, hinges and gate accessories -- sold nationwide through home improvement stores and distributors. In addition to Brooksville, Barrette Outdoor Living operates additional distribution centers in Galloway, NJ, Bulls Gap, TN; Flint, MI; Pendergrass, GA, Morristown, TN and Riverside, CA. For additional information, contact Barrette Outdoor Living at 1-800-336-2383 or visit www.barretteoutdoorliving.com. Barrette Outdoor Living is the North American Leader in wood, vinyl and aluminum fence, railing and outdoor living products. Barrette Outdoor Living is headquartered in Cleveland, Ohio and employs over 1,550 people in the USA. Barrette Outdoor Living produces and markets products under a variety of leading brand names through specialty retailers, home centers and lumberyards. Barrette Outdoor Living is a division of Barrette. Barrette employs more than 3,000 workers in 20 locations across the United States and Canada and is headquartered in St-Jean-sur-Richelieu, Quebec, Canada. The company is privately owned and operated by the third generation of the Barrette family.